The Tea Act, passed by Parliament on May 10, 1773, would launch the final spark to the revolutionary movement in Boston. The act was not intended to raise revenue in the American colonies, and in fact imposed no new taxes. It was designed to prop up the East India Company which was floundering financially and burdened with eighteen million pounds of unsold tea. This tea was to be shipped directly to the colonies, and sold at a bargain price. The Townshend Duties were still in place, however, and the radical leaders in America found reason to believe that this act was a maneuver to buy popular support for the taxes already in force. The direct sale of tea, via British agents, would also have undercut the business of local merchants. Colonists in Philadelphia and New York turned the tea ships back to Britain. In Charleston the cargo was left to rot on the docks. In Boston the Royal Governor was stubborn & held the ships in port, where the colonists would not allow them to unload. 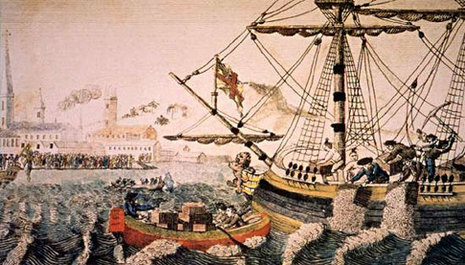 Cargoes of tea filled the harbor, and the British ship's crews were stalled in Boston looking for work and often finding trouble. This situation lead to the Boston Tea Party. Before the Act, smugglers imported 900,000 pounds of cheap foreign tea a year. The quality of the smuggled tea did not match the quality of the dutiable East Indian Tea of which the Americans bought 562,000 pounds per year. Some colonists claimed the tea-tax had been removed because the British wanted to dissuade them from boycotting British goods - which may well be at least partially true. However, some colonists went further, and pronounced the tea "unfavorable". Although the British tea was more appealing in taste, some Patriots encouraged the consumption of smuggled tea. All this however did little to damage the British tea trade. Before the Boston Tea Party occurred, the colonies did not agree with the decision to impose the Tea Act. In New York and Philadelphia, they sent the British ships with the tea on board back to Britain. In Charleston, the colonists left the tea on the docks to rot. The Royal Governor in Boston was determined to the leave the ships in port, even though the colonists refused to take the tea off the boat. The colonies did this to demonstrate their anger towards the Tea Act. The smugglers meanwhile were still smarting from the loss of their illicit income. Eventually, this led to the Boston Tea Party where American colonists, believed by some to be the Sons of Liberty, by others to be self-interested smugglers, dressed up as Mohawk Natives and threw 342 crates of tea from the East India Company ships Dartmouth, Eleanor, and Beaver into Boston Harbor. * The tea was to be marketed in America by special consignees selected by the East India Company. Many in England thought this law would be warmly greeted in America, because it allowed the colonists to resume their tea-drinking habit at a cost lower than ever before. Ships laden with more than 500,000 pounds of tea set off for the colonies in September 1773. The optimists in Britain were disappointed by the American reaction. Ordinarily conservative shippers and shopkeepers were directly impacted by the new law and were vocal in their opposition. Previously, American ships brought much of the tea from England, but that trade was now reserved for the East India Company. The shop owners objected to the new practice of using only selected merchants to sell the tea; many would be excluded from this trade in favor of a new monopoly. 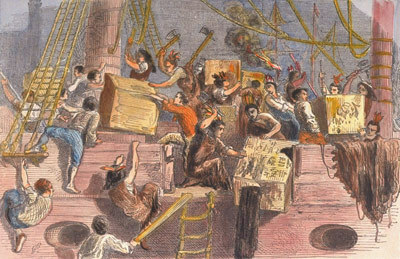 Opposition developed to the arriving tea shipments in Boston and other colonial ports. The Tea Act actually revived the flagging careers of agitators like Samuel Adams, who had been frustrated in recent years by the relative calm in the relationship with the mother country. The radicals found allies in the formerly conservative business community.